Robert Swinburne of Brattleboro, VT was the other winner of the city’s Sustainable Housing Design Competition. This house is designed to be a “gem” in any neighborhood. It’s small size and beautiful proportions are reminiscient of many older homes but with a modern flexible plan. The floor plans and the construction couldn’t be much simpler. The site layout allows for a traditional side driveway to a small backyard garage. The backyard space can be used for gardening, a dog yard, entertaining, play etc. The front of the house works well either pushed up to the sidewalk or set back with a short walk to the front steps. The front porch is large and deep enough to serve as an outdoor room in warmer months. 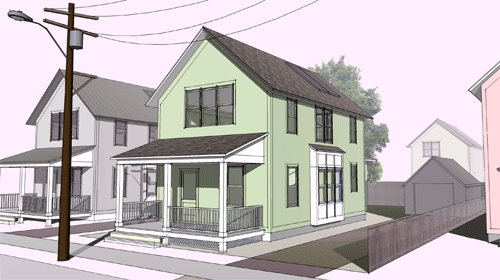 You can see more renderings and floorplans of Robert’s winning entry here.